At Animal Health & Medical Center, we treat your animals like members of the family. Our knowledgeable staff cares for both large and small animals in one convenient location. 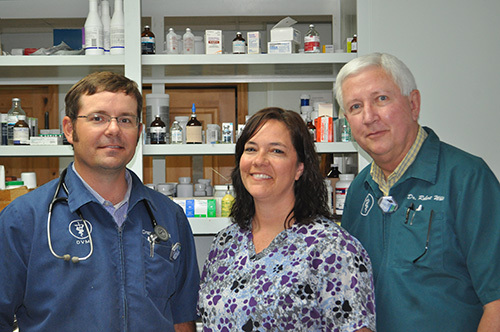 Since 1995, Animal Health & Medical Center has met the veterinary service needs of the greater Stephenville area. We know that your animals are more than just pets or livestock, and we give them the loving care they deserve. Animal Health & Medical Center offers world-class veterinary service with a local Stephenville touch. You can trust our skilled staff with your furry friends and prized livestock. From office support to technicians and veterinarians, our entire team is dedicated to keeping you and your pet comfortable in the most difficult circumstances. We have the trained veterinarians and clean, modern facilities to accommodate the treatment and care of any small or large animal. With us, you won’t have to run around town looking for a service provider. We offer in-house surgical facilities, x-rays, laboratories, pharmacies, and more. Do you like the convenience of shopping from home? We’ve partnered with MyVetStoreOnline to provide a one-stop store where you can order products from the comfort of home. MyVetStoreOnline carries a range of products including food, heartworm preventive, flea and tick products and more. We have all you need to meet your pets health needs. Order from a reputable pharmacy and have it delivered right to your door. Our reliable professionals know how to care for every animal in your household. From preventative care to emergency surgery, we’re Stephenville’s go-to vet for animals big and small. We have been taking animals to this clinic for 20+ years. They have worked wonderfully with our pets through happy times and sad times. The whole staff feels like family. Very kind and knowledgeable people. Very helpful with my cats and dogs.